NOTE: Due to limitations of the existing models provided by Transport Fever, the CN logo will be mirrored on one side of the car (Which is why I reversed the photos for this workshop item). If anyone of the game’s developers or moderators are seeing this, PLEASE avoid using mirrored textures and make the stock equipment in the game more mod-friendly! 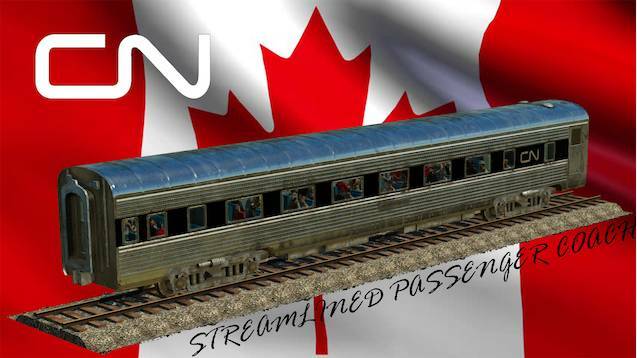 In 1952, Canadian National ordered 218 streamlined coaches from the Canadian Car and Foundry in Montreal as well as 92 sleeping cars, 20 dining cars, 17 parlour cars, and 12 buffet-sleepers from the Chicago-based Pullman-Standard Company. These cars were to be used for the Canadian National’s new cross-country flagship train, the Super Continental. These cars were only used until 1964, when Canadian National bought a plethora of lightweight coaches from The Milwaukee Road. After 1964, the 1954 streamlined cars were immediately put onto commuter services on the Quebec – Windsor corridor until 1978 when VIA Rail took over all passenger service in Canada.